On April 3, 1934, Valerie Jane Morris-Goodall is born in London, England to Mortimer, an engineer and Vanne, an author. Jane loves animals even as a child. When she is just over one year old, her father gives her a toy chimpanzee, in honour of a baby chimpanzee born at the London Zoo. Friends warn her parents that such a gift will cause nightmares for a child. However, Jane loves the toy and names the chimpanzee Jubilee, carrying it with her everywhere. At the age of just five, Jane hides for hours in a henhouse to discover where the eggs come from, unaware her family is frantically searching for her. Upon Jane’s return to the house, Jane’s mother sees how excited she is and rather than scolding her, instead sits down to listen as Jane tells her story. Jane’s childhood is a happy one with much time spent playing and exploring outside her family’s home in Bournemouth. But World War II is raging and Jane’s father is in the army as an engineer, disappearing from his daughter’s life for a time. After the war, Jane’s parents divorce. Jane left school in 1952 but couldn’t afford to go to University. So she learns to be a secretary and works for a time at Oxford University typing documents. Later, she works for a London filmmaking company, choosing music for documentaries. In May 1956, Jane’s friend Clo Mange invites Jane to her family’s farm in Kenya. Jane quits her London job, moves back home to Bournemouth, and works as a waitress to save enough money for boat fare. On April 2, 1957, at the age of 23, Jane travels to Kenya by boat. She has a wonderful time seeing Africa and meeting new people, but the most important event of her visit is meeting famous anthropologist and palaeontologist Dr Louis S B Leakey. Jane manages to impress Leakey with her knowledge of Africa and its wildlife to the extent that he hires her as his assistant. She travels with Leakey and his wife, archaeologist Mary Leakey, to Olduvai Gorge in Tanzania on a fossil-hunting expedition. “I could have learned a whole lot more about fossils and become a palaeontologist. But my childhood dream was as strong as ever–somehow I must find a way to watch free, wild animals living their own, undisturbed lives–I wanted to learn things that no one else knew, uncover secrets through patient observation. When Leakey and Jane begin a study of wild chimpanzees on the shore of Lake Tanganyika, British authorities resist the idea of a young woman living among wild animals in Africa. They finally agree to Leakey’s proposal when Jane’s mother Vanne volunteers to accompany her daughter for the first three months. On July 14, 1960, Jane and Vanne arrive on the shores of Gombe Stream Chimpanzee Reserve in western Tanzania. But studying the chimpanzees of Gombe was not easy. The animals fled from Jane in fear. With patience and determination she searched the forest every day, deliberately trying not to get too close to the chimpanzees too soon. Gradually the chimpanzees accepted her presence. Jane observes meat-eating for the first time October 30, 1961. Later, she sees the chimpanzees hunt for meat. These observations disprove the widely held belief that chimpanzees are vegetarian. On November 4, 1961, Jane observes David Greybeard and Goliath making tools to extract termites from their mounds. They would select a thin branch from a tree, strip the leaves and push the branch into the termite mound. After a few seconds they would pull out the termite-covered stick and pick off the tasty termites with their lips. Jane’s work in Gombe becomes more widely known and in 1962 she is accepted at Cambridge University as a PhD candidate, one of very few people to be admitted without a university degree. Some scholars and scientists give Jane a cold reception and criticise her for giving the chimpanzees names. “It would have been more scientific to give them numbers”, they say. Jane has to defend an idea that might now seem obvious: that chimpanzees have emotions, minds and personalities. 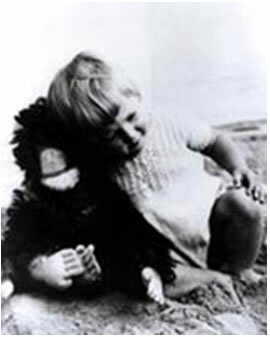 Jane earns her PhD in ethology (the study of animal behaviour) in 1965. Also in 1965, National Geographic grants funds for the construction of aluminum buildings at Gombe and with these first permanent structures on the site, the Gombe Stream Research Centre is born. Jane and Hugo divorce amicably in 1974. In 1975, Jane marries Derek Bryceson, member of Tanzanian parliament and Director of Tanzania’s National Parks. 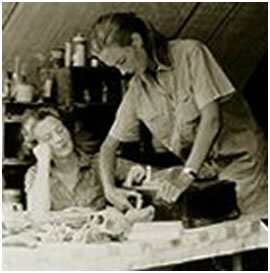 In 1977, Jane founds the Jane Goodall Institute for Wildlife Research, Education and Conservation. Jane’s husband, Derek, passes away in 1980 after a battle with cancer. In 1984, Jane begins groundwork for ChimpanZoo, an international research programme of the Jane Goodall Institute dedicated to the study of captive chimpanzees and to the improvement of their lives through research, education and enrichment. During November of 1986, at a scientific conference in Chicago organised around the release of Jane’s scholarly work The Chimpanzees of Gombe: Patterns of Behaviour, Jane and fellow attendees are stunned as consecutive speakers make clear the extent of habitat destruction across Africa and its threat to chimpanzee survival. Jane leaves the conference knowing that she must leave Gombe behind, and work to conserve wild chimpanzees. In 1988 the Jane Goodall Institute UK is founded as a charity. In 1991, Jane and 16 Tanzanian students founded Jane Goodall’s Roots & Shoots, JGI’s global environmental and humanitarian education programme for young people. The Lake Tanganyika Catchment Reforestation and Education project (TACARE) is launched in 1994. This programme helps communities situated around Lake Tanganyika to create sustainable livelihoods agriculture, micro-finance initiatives and education as a means to conserve local habitat and animal species. On April 16, 2002, United Nations Secretary-General Kofi Annan appoints Jane to serve as a United Nations Messenger of Peace. Jane is made a Dame of the British Empire (the equivalent of a knighthood) on February 20, 2004 during a ceremony at Buckingham Palace in London. In 2006, Dr Goodall received the French Legion of Honor, presented by the Prime Minister Dominique de Villepin, as well as the UNESCO Gold Medal Award. 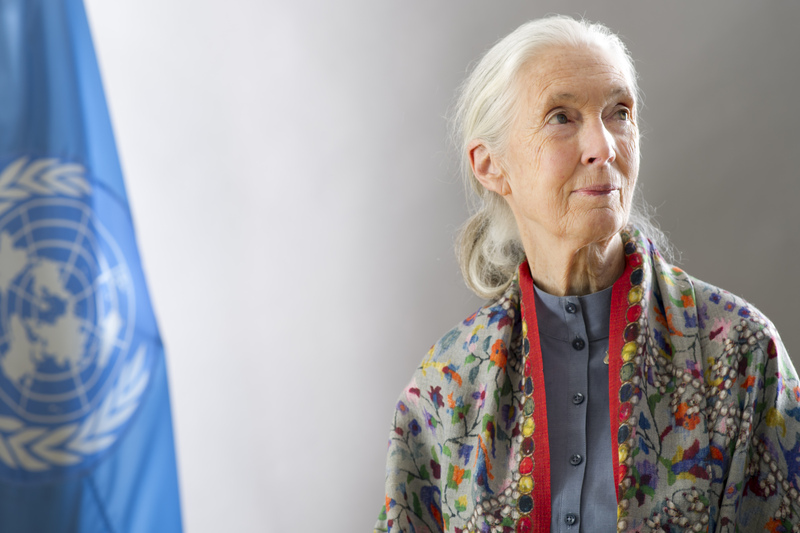 Dr Goodall’s list of publications includes Hope for Animals and Their World: How Endangered Species are Being Rescued from the Brink, two overviews of her work at Gombe — In the Shadow of Man and Through a Window — as well as two autobiographies in letters, the best-selling autobiography Reason for Hope and many children’s books. The Chimpanzees of Gombe: Patterns of Behaviour is the definitive scientific work on chimpanzees and is the culmination of Dr Goodall’s scientific career. 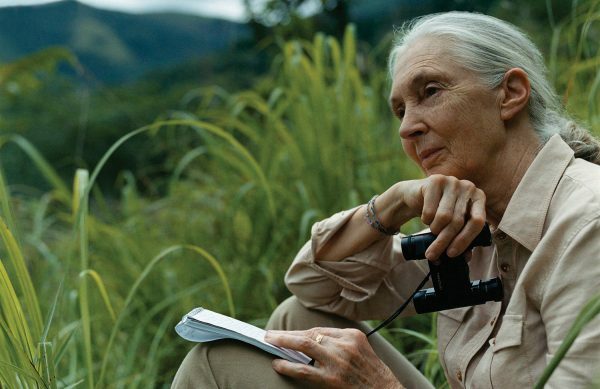 Jane has been the subject of numerous television documentaries and is featured in the large-screen format film Jane Goodall’s Wild Chimpanzees (2002). She also has been featured in five Animal Planet specials—Jane Goodall’s Return to Gombe, Jane Goodall’s State of the Great Ape, Jane Goodall’s Heroes, When Animals Talk and most recently, Almost Human. Jane continues her work today by travelling an average of 300 days per year speaking in venues around the world about the threats facing chimpanzees, other environmental crises, and her reasons for hope that we will ultimately solve the problems that we have imposed on the earth.